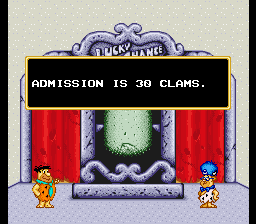 The Flintstones - Treasure of Sierra Madrock is a platform game based on the cartoon. This prototype of the game is almost complete. Thanks to Martin at NES World for the ROM Image! 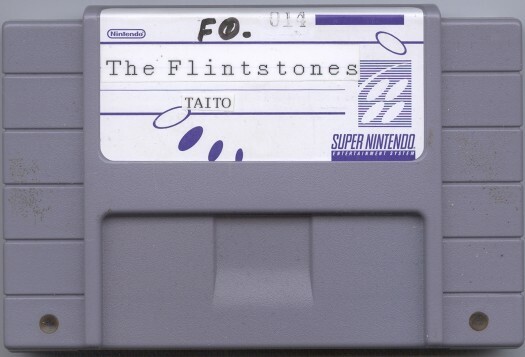 The prototype of The Flintstones is of the US version, which surprised me a bit considering that this was developed in Japan. The prototype appears to be pretty much the same as the final version, except for one thing - the prototype is full of slowdown. If you look at the animations below, Fred appears to run about twice as fast in the released version. However, the timer runs exactly the same as in the final version, meaning that you can easily run out of time, even in the first few levels. December 27, 2015 update: The slowdown observed above is a result of emulators incorrectly assigning the wrong mapping. If you use the mapping from the released US version in Higan, it fixes the slowdown problem. Looking at the binary in a tile viewer, the graphics appear to be compressed differently between the prototype and the final. This may account for why the binary is 41% different (though at least some of that is due to data offsets). However, this does not change the visuals, as far as I can tell. If you look carefully at the gifs above, you will notice that the way the top stats and Fred's club appear are different between the prototype and final. 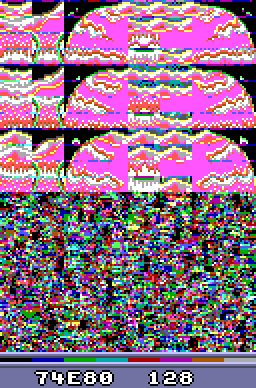 In the prototype, they all appear at once, while in the final version, different elements appear in different frames. Below, I show the difference between the prototype and released version using a tile viewer. 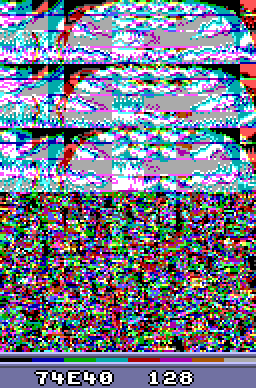 These appear to be graphics tiles (though after playing through the entire game, I was not able to find out where they are in the game), but they look different, and there is an offset in the binary itself. The only real difference in the game that I found was the admission fee for the Park. The sound test option also has 35 tracks (compared to 21 in the released version), though there definitely are repeated and blank tracks in that mix.